Fox Sports 2 (FS2) is a U.S.-based sports channel. Combined with its sister channel, Fox Sports 1 (FS1), this channel offers high-profile sports shows, including top-caliber competitions from several regions in the world. FS2 is available on most cable and satellite TV suppliers in the U.S., along with some IPTV platforms. DirecTV, DISH Network, AT&T U-verse, Verizon FiOS and Google Fiber are some of the services carrying this channel. Fox Sports 2 might include in its programming some of the top European club competitions, such as the UEFA Champions League and Europa League. Added to that, this channel might offer some of the most competitive domestic leagues in Europe and the American continent. Games featuring National teams fighting for a spot in the FIFA World Cup might also be available on this channel. 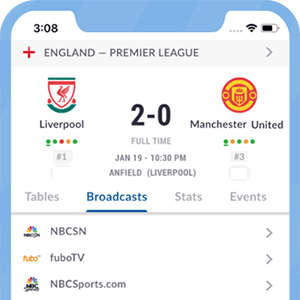 Added to its detailed football coverage, FS2 also broadcasts sporting events related to mixed martial arts, car racing, Australian football and more. All of FS2's content can be streamed online via Fox Sports GO. Users need a subscription to a cable or satellite TV company to access this platform, since their supplier will authenticate them to watch games on their mobile devices or computers. What channel is Fox Sports 2 on? SlingTV: Available in the Sling Blue Package. Fox Sports 2 is also available on most cable TV carriers in the U.S. Check your local listings for availabilty. *Got itLive Soccer TV does not provide Fox Sports 2 USA live streaming. The information provided on this page is simply Fox Sports 2 USA soccer TV schedule.